Nadia Awni Sakati is a prominent Syrian-Saudi pediatrician who has contributed to many discoveries and advances in the field of medical genetics. 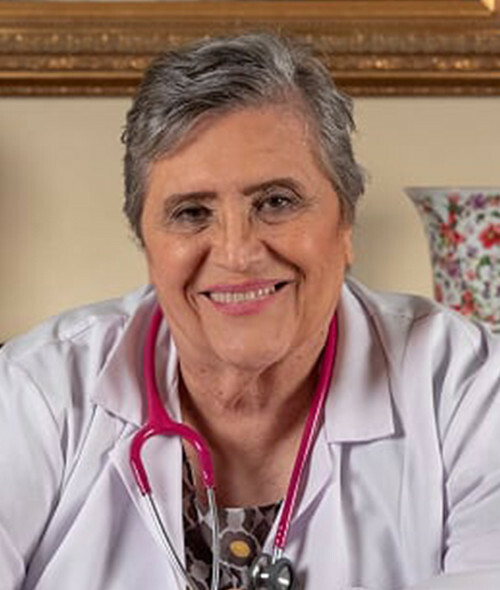 Born in Damascus, she received her medical degree in 1965 from the Damascus University Medical School. She knew she was going to become a doctor since she was in 8th grade when she wrote a comparative composition about her and a classmate sharing a dream of wearing a white gown; her classmate was the bridal white gown, while hers was the medical gown. Her father encouraged her to continue her medical studies in the US: he died 6 months before her graduation in 1965 from medical school in Damascus. After that, she got accepted to study in the United States but enrolled in the American University of Beirut instead, choosing to stay by her widowed mother. She spent her residency in Pediatrics at the American University of Beirut and Jackson Memorial Hospital in Miami, Florida, later pursuing a Fellowship in Genetics and Metabolic Diseases in the University of California in San Diego. In 1978, Dr. Sakati joined King Faisal Specialist Hospital and Research Centre. In her many years at KFSHRC, she has held several noteworthy positions, including Chairman of Pediatrics from 1987 to 1989, Director of Genetics/Endocrinology and Metabolic Disease Fellowship Program from 1989 to 1995, Head of Medical Genetics Section until 2001, and Distinguished Senior Consultant until today. Nadia Sakati holds an American Board of Pediatrics, an American Board of Pediatrics Endocrinology, and an American Board of Medical Genetics, Clinical Genetics. She is also a member of many prestigious medical societies mainly the American Society of Human Genetics, the American Academy of Pediatrics, Lawson Wilkins Pediatric Endocrine Society, American College of Medical Genetics, and American Pediatric Society. Her discoveries and research in genetic disorders resulted in the books she co-authored books with Dr. William Nyhan, “Genetic and Malformation Syndrome in Clinical Medicine, 1976” and “Diagnostic Recognition of Genetic Disease, 1987”. Dr. Sakati was offered the Saudi Nationality by King Fahed bin Abdulaziz in 1993. For the last 50 years, she has witnessed, lived and worked through a lot of advances in the field of medical genetics; from knowing the exact number of chromosomes to the genome project and the whole exome sequence to now offering families pre-implantation genetic diagnosis. She has also worked on chorionic villus sampling and carrier detection to help many families have healthy children. During her 40 years at King Faisal Hospital, she found general pediatrics to be challenging and rewarding as much as her other specialty, working with many children from the Saudi royal family and other families. Dr. Nadia Sakati is also the force behind the training and graduation of many Saudi residents and fellows, a feat she remains the most proud of.